A man jailed for eight months for stalking a former partner has had that sentence quashed on appeal. Michael Paterson, 40, was locked up at Jedburgh Sheriff Court in November after admitting embarking on a course of conduct likely to cause the woman fear and alarm. 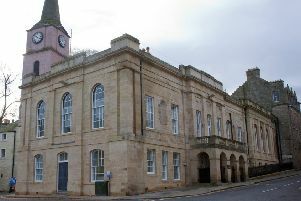 The self-employed joiner, of Howdenbank, Hawick, admitted sending her abusive and threatening text messages and making abusive and threatening telephone calls, going to her home uninvited and entering it without permission, shouting and swearing, making offensive and abusive comments and acting in an aggressive manner. That offence was committed on various occasions in June and July last year after their three-year relationship came to an end. The court heard that when the victim finally reported the matter to police, Paterson telephoned her home 49 times, and there were 20 missed calls on the woman’s mobile during the period that she was at Hawick police station. In addition to the now-overturned prison sentence, an 18-month non-harassment order was imposed. Following a hearing at the Sheriff Appeal Court in Edinburgh, Paterson’s appeal against his jail sentence was sustained. That term of imprisonment was replaced by a one-year community payback order including supervision.